While walking in a very historic graveyard this past weekend at a unique little corner of the world called Chaffey’s Locks’s, north east of Kingston, Ontario, I saw a plaque that finally cleared up the mystery. 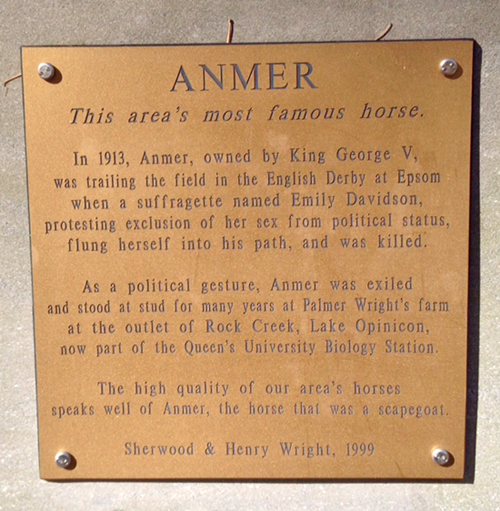 Apparently, according to the plaque, three years after Epsom the King gave Anmer to Ontario’s Department of Agriculture and the horse became a leading sire in Canada. He lived, according to the plaque, at Palmer Wright’s Farm at the outlet of Rock Creek, Lake Opinicon. I am so glad that Anmer was fine, but feel bad that he was exiled like Eva Braun. Not cool. Eva Braun and Hitler committed suicide after losing the war. They ran away, they were not exiled. Don’t know who Eva Braun is ? Look it up you uncultured swine.